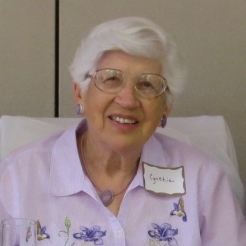 Cynthia Biasca passed away at her home in Los Gatos, CA on April 13, 2019, shortly before her 99th birthday. Cynthia was born on May 8, 1920 to Irving Brott and Olive Morgan in Hartford, CT but grew up in Buffalo, NY. She attended Radcliffe College for two years, switched to nurses’ training, and enlisted in the Army Nurse Corps in 1943. She served as an army nurse in Iceland and England until the end of WWII. After the war, she returned to Radcliffe and received a degree in biochemistry. She got a job in San Francisco, where she met her husband, Frank Biasca. They were married in December 1948, had four daughters, and were together until Frank’s death in September 2010. Once the girls were in school full time, Cynthia went back to school for her teaching credential and taught 5th grade for six years until Frank was transferred to Houston in 1972. In Texas, Cynthia took up new volunteer work and hobbies, of which shell-collecting and genealogy remained passions for the rest of her life. She took many shell-collecting trips within the U.S, to the Caribbean, and to the South Pacific, eventually accumulating a 4,000-species shell collection of museum quality. In addition, Cynthia and Frank began taking trips all over the world together, including 16 with Elderhostel alone. Around 1975, Cynthia began researching her father’s paternal lineage. She and her sisters took yearly trips to NY, visiting courthouses, city halls, historical societies, churches, and cemeteries. She also did research at local genealogical libraries and gathered information from many correspondents. She amassed so much data on the Bradt/Brott family lines that she wrote a nearly 800-page reference book following the descendants of two Bradt brothers who arrived in America in 1637. She was also instrumental in bringing about the first of many Bradt Family Reunions. Cynthia and Frank returned to CA in 1982, settling first in Fremont for 15 years. During this time, she volunteered at the California Academy of Sciences in San Francisco in the Conchology Department and worked as a docent at the Oakland Museum. In 1997, they moved to The Terraces of Los Gatos, where Cynthia served on committees, managed the gift shop for eight years, joined a walking group, and enjoyed the many activities and outings available to residents. She also became an enthusiastic bird watcher, thanks in great part to the proximity of Los Gatos Birdwatcher and their organized excursions. Cynthia continued to enjoy the birds that frequented her seed feeder and hummingbird feeder until she moved from her independent apartment to an assisted living studio in early 2017. Family was of special importance to Cynthia and Frank, who organized summer reunions with their children and grandchildren for many years until Frank’s health declined. For her 95th birthday, Cynthia’s special wish was for another reunion, so 19 family members, including two great-grandchildren, converged on a huge house on the Oregon coast for a wonderful week together. In the summer of 2018, Cynthia was treated to visits from her out-of-town grandchildren and great-grandchildren, then numbering four, in whom she took special delight. A warm, caring woman, Cynthia made close friends wherever she went, touched the lives of many people, and was a great role model to younger generations. She will be greatly missed by all who knew her. Cynthia is survived by her daughters Patty Biasca (Bob), Marie Emerson (Tony), Beth Biasca, and Kathy Chalfant (Duncan); grandchildren Missi, Justin, Sandra, Eric, and Gina; great-grandchildren Leila, Mayhem, Marc, Silas, and Ebey; her sisters Barbara Myers (Jerry) and Harriet Wenger; and numerous other relatives. Contributions may be made in Cynthia's memory to Suncrest Hospice, 42808 Christy Street, #216, Fremont, CA 94538.